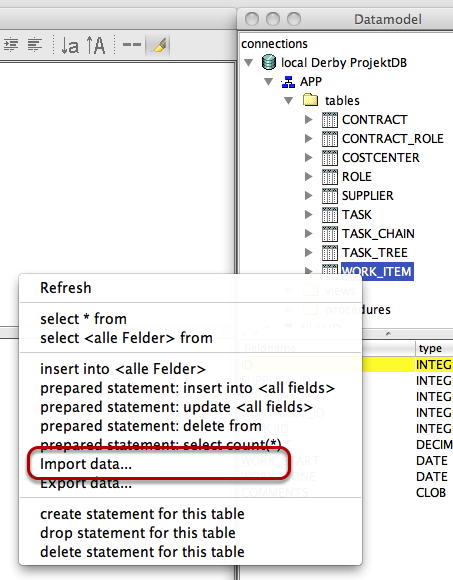 Open Datamodel and choose the table you want to import data by selecting "Import data..." from table context menu. In the top area yo define the data source e.g. file name and sheet name (only if you import data from spreadsheets, leaf it blank to use the first sheet). You can see a life preview what happens in your import, try to play test dataset. It doesn' t matter how large your file is, it will never loaded at once and shows immediatly a result. The panel Field Delimiter is only used for text files, for spreadsheets this panel will be ignored. The panel Target database table let you decide what to do with the new data. 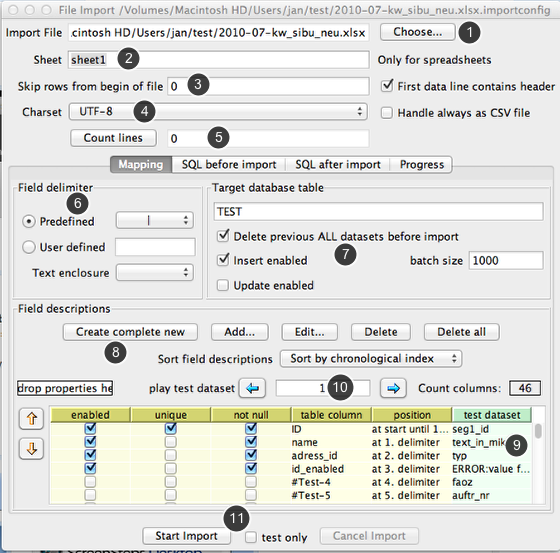 The batch size can only be filled and used for insert only imports. The pane Field descriptions you define the mapping between the file contents and your table columns. This table is drag&drop enabled. You can drag the table to any text editor and get the complete import description as text in form of properties. You can drop a import description as text in the smal text area labeled with "Drop properties here". 5. Check the number of rows. For spreadsheets the last row is the first empty row! Unfortunatly all other counters are not reliable! The important things here are the datatype and the kind of positioning. An intersting feature is the aggregate values function. If the import does an update, a numeric values will added to the current value. The feature "Ignore dataset if field is invalid" helps to keeps the logfile clean, if you know, that this field is acceptable malformed and you want to filter your import. Use Locale for Date and Numeric formats to reflect different localized formats. E.g. 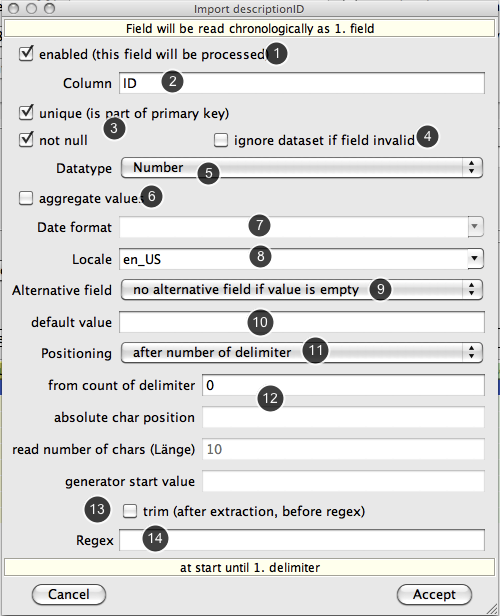 in numeric fields the locale defines what char is to use as decimal delimiter. If a field is empty you can take the content from an alternative field (That can lead in a cascade if the alternative field as an alternative field themself). 4. If checks will be fail, should we continue with import?